Bean bag filler is extremely important when it comes to comfort and durability. You might not consider what’s inside of a bean bag chair as long as all you want is to relax. However, the material inside and cushioning of the bean bag decides invariably it’s softness and comfort grade. Bean bag filler elements can be very noisy and crackling, so every time you move, the bag will make strange noises. A bean bag should always be soft and spongy, depress with your weight but be firm enough to support your body. Moreover, it should be durable, sitting on it for an extended period shouldn’t destroy it. Why Bean Bag Chairs Go Flat and How To Prevent It? What Is the Best Bean Bag Filler? How Much Beans is Needed to Fill My Bean Bag? Many people new to beanbags are shocked to discover that their fluffy bean bags have gone flat have extended periods of regular use. What was once a fluffy, round and comfortable chair has become a flat disc about half the size. However, this is a universal phenomenon experienced by all bean bags filled with traditional polystyrene beads. Fortunately, you can take several steps to prolong the life of your bean bags, and most of them can be refilled once the beads go flat. While several bean bag filler alternatives are commonly used, the most comfortable, durable and resilient filler is virgin EPS beads. Most bean bags are stuffed with beads made of expanded polystyrene (EPS), which is a close relative of Styrofoam. Quality bean bags are filled with virgin beads that are manufactured exclusively for use in bean bags. These beads have numerous pockets of air inside them, and as they are used, the beads become compressed, reducing their size. This compression, in turn, gives the beanbag a flat appearance, and it compromises the comfort and ergonomics of the furniture. Before you refill a bean bag, you may be able to prolong its usability by attempting to fluff the contents. To do this, you need first to unzip the child-resistant cover in a safe environment. Always keep a close eye on open bean bags, and never allow a child or pet to crawl inside. If your bean bag does not have a zipper or enclosure, do not attempt to cut or rip it open. These bean bags are meant to remain closed at all times. How long it takes until I need to do a bean bag refill? Bean bag chairs are very durable, and only get flat when not used properly. A quality bean bag is supposed to refill after 2-5 years, depending on type of filler. After you have removed the outer shell, flip the beanbag chair over. Next, hold the bottom of the chair and shake it up and down firmly. Repeat this action repeatedly until you reach the desired level of fluffiness. The more you agitate the inner core of the chair, the fluffier it will get. Once you have the bean bag open, hold it, so the opening is facing upwards, and shake it for two to five minutes. As you shake the beanbag, it will regain some of its fluffiness. After closing the bean bag and activating the child-resistant mechanism, sit on it to see if it provides adequate support. If not, you can try to fluff it again, but if a second fluffing does not do the trick, it is time to refill your bean bag with new beads. Does your beanbag need plumping up a bit? When this happens, do not panic. You need to refill your bag and we compiled the ultimate bean bag filling buyers guide. Revive your slouching bags and watch your favorite beanbag come back to life. Bean bags can be filled with anything you want. The natural filler includes dried grains, buckwheat hulls, sand, and even hay or feather. But these beanbag fillers are not practical choices because it makes sitting extremely uncomfortable. So, there are three types of bean bag filler that are commonly used nowadays. We’ll discuss them later into this article. Every bean bag has his own size and thus you must be aware of exactly what quantity you need to refill a beanbag chair. Make sure you calculate the right quantity and purchase respectively. The quality of bean bag filler is crucial. Purchase only good quality beans so that it can attain the comfort you are looking for. Poor beans mean less comfort and probably you’ll need to refill your bean bag chairs earlier than necessary. The durability of refill beans is also important. If the refills start to shrink after a few weeks, it’s nothing that a waste of your money. When you purchase filler for a bean bag, make sure that the product shows a promise of longevity. Memory foam is the most durable type of bean bag filling – it also retains its shape for months, doesn’t sink or squish under the weight, and is resistant to moisture and heat. Since EPS beads are 98 percent made of air. they tend to flatten a lot sooner, particularly if the beanbag is used frequently. Most bean bags are filled with EPS and as long as you are not heavily using it every day, it should last a few months with no problems. Bean bag comfort is based on inner experience rather than facts, yet most people have very similar requirements from bean bags – to be very comfy. When filling a bean bag chair, the comfort is associated with the degree of firmness that you prefer. Some people like a soft surface that sinks in when they sit, others like a firm surface. Compressed memory foam might be a better choice for softer surfaces, and if you like a firm fill, purchase EPS beads. For example, when considering buying a bean bag chair for gaming, comfort becomes your first priority. Bean bag refills is a recurrent expense you’ll have to perform for the lifespan of the bag. In terms of cost, EPS beads are the cheapest option followed by plastic pellets, while memory foam is the priciest. It is critical to restoring a bean bag to its chunky form but it must not cost an arm and a leg – only a small fraction of a new identical product. No one likes to move a heavy bean bag around the house. A great bean bag chair is meant to be light and portable. EPS beads are the lighter options as a bean bag filler material. Memory foam is pretty light as well. Polyethylene plastic pellets are the “heaviest” and normally used for smaller-sized bean bags to provide stability. In terms of a level of filling, some people prefer bean bag chairs to be about half filled for more of a comfy feeling, while others prefer it to be almost filled to the top. As a good note, you can buy bean bag chairs unfilled, which allow selecting the amount of filling you want. Try to get a bean bag chair with a quality cover, zippers, stitching, and a durable inner layer. Make an investment in a product that will last and provide years of comfort. Fluff the bean bag on a regular basis. Over time the filling inside the bean bag chair becomes compressed through frequent use. You can also pound and shape the chair into any position you desire, and the reground filler will hold the shape. Once the beanbag goes flat, you have to order additional new filling. Calculate the exact volume you need to purchase. Natural bean bag filler – a great option for those who prefer the traditional and eco-friendly bean bag chairs. Natural bean bag fillers are dried beans, dried peas, unpopped popcorn, and rice. Natural fillers are cheaper options and do not lose their stuffing capacity quickly. The main disadvantage is that they attract pests, are much heavier and don’t provide the much-expected comfort. Some people prefer natural bean bag fillers because of the texture that can help massage tired muscles. Shredded foam filler – this type of bean bag filling is made from polyurethane foam, a traditional foam fabric in making pillows, poufs, ottomans, crafts, stuffed animals, pet beds, chairs, and couches. Bean bags with shredded foam filler use foam cut into tiny, super durable pieces. The flexible property of shredded foam allows bean bags to back into shape after being depressed. This type of filling is more flexible but less stable compared to polystyrene beads. 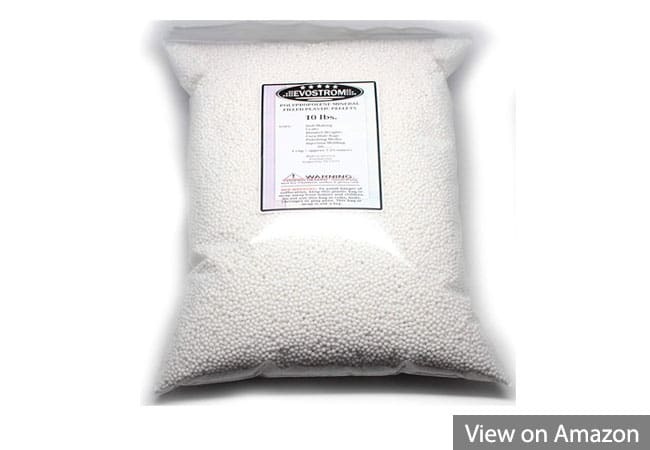 Expanded PolyStyrene (EPS) Beads – most bean bags are filled with EPS. EPS is a hard-celled plastic very similar to Styrofoam, which is extruded polystyrene. EPS is perfect for most bean bags because it is lightweight but rigid enough to retain its form. In fact, EPS is 98 percent air. The EPS beads used for bean bag filler are 3 mm to 5 mm in diameter, plus, they are resistant to moisture and heat. Even EPS is not biodegradable, it can be reused and recycled. When you need replacement beads, it is recommended to use virgin beads rather than recycled beads, which may have a shorter lifespan. Polystyrene pellets are tiny synthetic polymers. Polystyrene pellets are similar to polystyrene beads except that they are smaller in size, have a cylinder form but rounded on one side. Good elasticity and compression deformation resistance provide maximum comfort and durability compared to other bean bag fillers. The material has also excellent heat-insulation properties, high impact strength, vibration resistance, dustproofness, and resistance to physical processing. Expanded PolyproPylene (EPP) is a thermoplastic polymer more popular in Asia. EPP foam is very strong and durable yet incredibly resilient. They do not lose their volume as quickly as EPS beads do, and they do not have a strong odor. The primary problem with EPP is that they are very sensitive to fire and burning, and it also degrades when exposed to oxygen. EPP has excellent energy absorption and high strength properties, it is durable, lightweight, and recyclable. EPP can withstand multiple impacts without significant damage. As bean bag filler, Packing Peanuts have been in the top many years ago. The packing peanuts (you may know them as “popcorn”) are made of expanded polystyrene (EPS), which most people mistakenly confuse with the Dow Chemical Company trademarked name Styrofoam. They are roughly the size and shape of an unshelled peanut. Packing peanuts have larger sizes than polystyrene beads but are considerably more lightweight. Polystyrene peanuts have fallen out of favor because of worries over chemicals used in their manufacture process and the fact that they aren’t efficiently recycled. Looking for a bargain? Check best beanbag chair deals and prices in 2019 . Polystyrene beads are available in virgin (new) or recycled (reground) types. Even there is no difference in the look of polystyrene beads made from either source, some recycled polystyrene beads are made from crushed and crumbled up polystyrene blocks instead of recycled bottles. And these beads may be non-uniform in appearance and texture. The variation in size has an effect on how the bag feels, allowing it to conform better to the body. Virgin bean bag filler beads are perfectly smooth and round. Because the beads are all the same shape they shift around each other better when you seat in the bean bag. Virgin is also denser so it doesn’t go flat as fast. How fast you have to refill depends on how much you use your bean bag and how puffed you like it. Some people refill within a few months, some never refill and like them flat. Recycled bean bag filler beads are particles that have been ground into chunks. These are irregular pieces of polystyrene and wear down faster than virgin beads. Because it’s the cheapest type, many bean bags are sold with this type of filler in the first place. That’s why some beanbags do not have a uniform shape and requires more work to get the beanbag in shape. You might be able to get it to hold form, anyhow, it will not nicely mold to your body when you sit in it. Certainly, the recycled beads do not hold up as long as the virgin beads, and will also go flat much sooner. You may be surprised to know that the first bean bag chairs were filled with organic beans! The beanbags we know today no longer use natural materials. For organic and earth lovers, here are some options for bean bag filling. 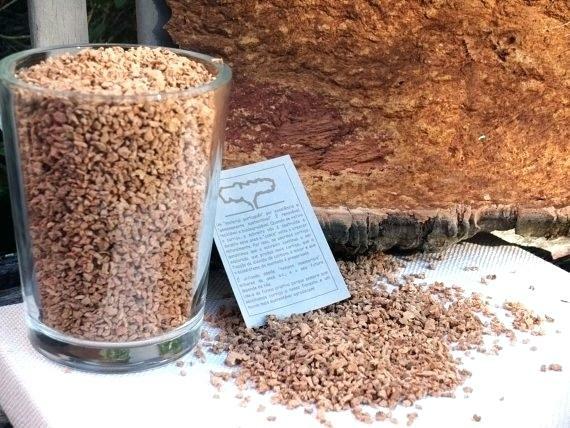 Cedar shaving – the natural aroma of cedar might delight you and keep bugs away, thus this type of bean bag filler is mainly used to drive away unwanted insects. Cedarwood oil holds calming and grounding properties for both the mind and body, making it a popular oil for topical as well as aromatic use. Plus, cedar shavings is 100 percent eco-friendly. Some bean bag manufacturers combine cedar shavings with natural bean bag fillers (dried beans) for optimum comfort. Sawdust – if you are passionate about woodworking you probably have a lot of sawdust. If that is not the case, you can easily order it online. Like a bean bag filling, sawdust is malleable and solid at the same time. We recommend this type of filling if you have a more durable bean bag cover. Hay – this is a great bean bag filling alternative, it’s accessible to anyone who lives in the countryside. For the city families, you can buy it online at a really good price. Hay is light and soft, making it a perfect natural bean bag filling alternative. A piece of good advice is to be careful and make sure that the hay is completely dry, otherwise, you have a chance it will produce mold. Another option here is straw (an agricultural byproduct consisting of the dry stalks of cereal plants after the grain and chaff have been removed). Feather – if you have old pillows you no longer use, recycle the feathers by putting them into a beanbag. Before memory foam or EPS beans, people used feathers to fill stuff due to their softness and the comfort they provide. Feathers tend to lump together, so you might want to try combining them with cedar shavings, beans or polystyrene beads for the best effect. Be careful when you fill your bean bag with them. If you don’t do it slowly and with care, you will end up with a room full of feathers. Bean bag stuffing – plush toys are a great filling alternative for beanbags. They are soft and their shape won’t change or flatten out like other fillings. This alternative is effective to store old toys and save more space in your kids’ room. Try not to overfill the bean bag, become too stiff and it won’t be as relaxing as it could be. Do not to use toys that contain hard parts because you can injure yourself. Other fillers include buckwheat hulls, sand, small pebbles. Works well in do it yourself (DIY) projects – materials like dry cherry pits, rice, and wheat. Mixed fillers – there are bean bags with a mixture of two or more of the different types of fillings. 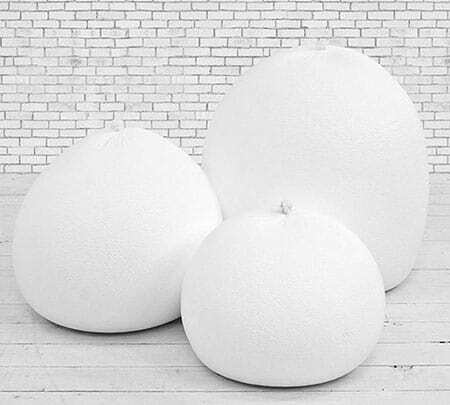 Some bean bag manufactures employ a combination of polystyrene beads and shredded foam – this mixture allows bean bag chairs to be more comfortable. If you decide to fill your bean bag chair with reground polystyrene make sure to purchase enough filling that you will have some extra left over when complete. Over time the filling will become compressed and settle as the air is pushed out of the chair. You can use the left over filling to refill your bean bag chair and keep it in like-new condition. If you have children, be warned that kids will often want to jump on the bean bag chair. All bean bag chairs are built to take abuse, but do have limitations. It’s best to keep children from jumping off furniture or stairs and onto the chair. Polystyrene filling may present choking hazard for children. If you have children it is advised you purchase a bean bag chair with a secure zipper or security flap that children cannot easily open. If you are buying the first bean bag refill pack, then you might be paying more than you should. There’s a lot of hype in the furniture industry and what seems like the best choice may not always be so. We will help you understand the pros and cons of each variety, and show you what variables to consider before you make a choice for the best bean bag filler in the market. 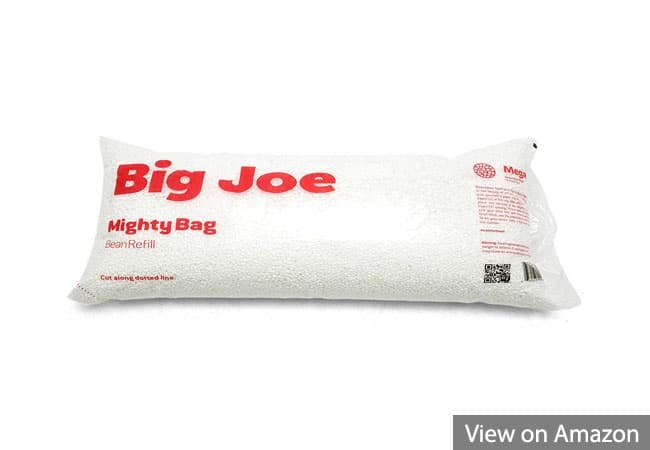 Big Joe Megahh bean bag refill is our top choise among all the cheap bean bag fillers in the market currently. This is a single pack, each one with 100 liters of refill beans – that’s approximately 3.5 cubic feet of beans per bag (enough beans for an adult-sized bean bag). The Megahh Ultimax pack is full of beans made of 100% virgin polystyrene. These beads are longer-lasting, up to 20% more dense than other beads. They are also lighter, making the entire bag lighter and easier for carrying. Big Joe is an American brand that manufactures bean bag refills and other furniture products, and most Big Joe bean bag chairs take 1 – 2 bags to rejuvenate. Purchase a refill pack and give a much-needed dose of plumpness to your bean bag. For the price, you get quite a bit of beads to work with as well. Lastly, these refill beans are used for various crafting projects, as packing material, or arts and crafts. Top rated bean bag refill. 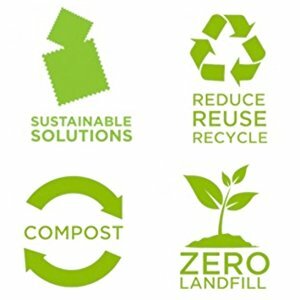 Manufactured in a zero landfill certified facility. Beans are very small as size. Shredded memory foam filling is what allows the compressible surface. Unlike regular memory foam that contours to your body, shredded memory foam take on your weight and redistribute it without becoming too tightly packed together, thus creating a harder, unyielding surface. This also allows for an increase in airflow as the space between the shredded foam supports breathability, unlike a solid memory foam which has a poor cellular structure for a free flow of air. With the use of a shredded version, you receive all the benefits of the memory foam contouring, without any of the heat retentions it often has. 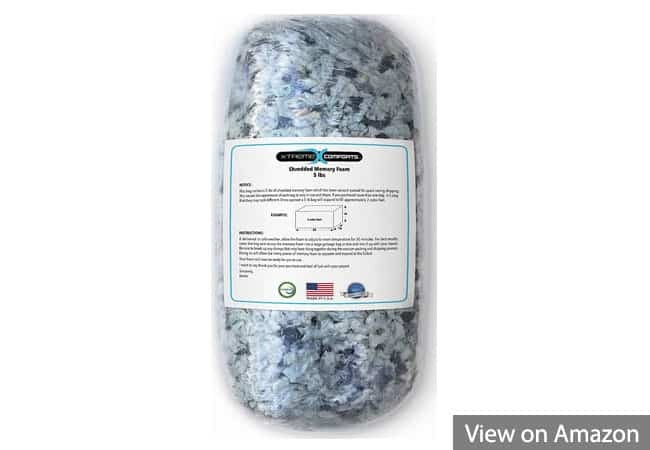 Xtreme Comforts Shredded Memory Foam Fill meets the CertiPUR-US standards for content, emissions, and durability, and are analyzed by independent, accredited testing labs. Has no ozone depleters, TCEP flame retardants, TDCPP, PBDEs, lead, mercury, and heavy metals, formaldehyde, phthalates regulated by the CPSC, or CFCs. It is more comfortable than traditional polystyrene beads and styrofoam filling pellets. Is perfect for stuffing for bean bag chairs, pillows, couch, sofa cushions, stuffed animals, upholstery, arts, and crafts. Simply re-fluff to bounce back to original shape. It is comfortable, soft and gentle. This Certipur memory foam fill from Xtreme Comforts rates among the best options you have. Compressed packing for easy shipment – 5 pounds expands to about 2 cubic feet when fully fluffed and expanded. Easily fill one adult sized bean bag. Does not get flattened with daily use. Does not create pressure points. No odor or off gassing. Pricier than standard bean bag chair refill beans. Polypropylene plastic pellets are not the best choice for large sized bean bags chairs. But certainly they are perfect filler for bean bag chair for kids, dolls, corn hole bags, foot bags, and blanket weights. Evostorm Polypropylene Plastic Pellets comes in a 10 lbs pack manufactured in the United States. Each pellet is uniform sized (0.125 of an inch), with a natural color, and it is an excellent high-density fill material. There is no odor or pigments used in the pellets and you can easily use these also for arts and crafts projects. More importantly, these are completely non-toxic and can be washed and dried after use. The pack of pellets comes in a heat-sealed bag that can be used as storage for any leftover pellets that you may have. Even they advertise their polypropylene plastic pellets as not intended for bean bag chairs, there is no reason why you cannot use these for refilling your bean bag. 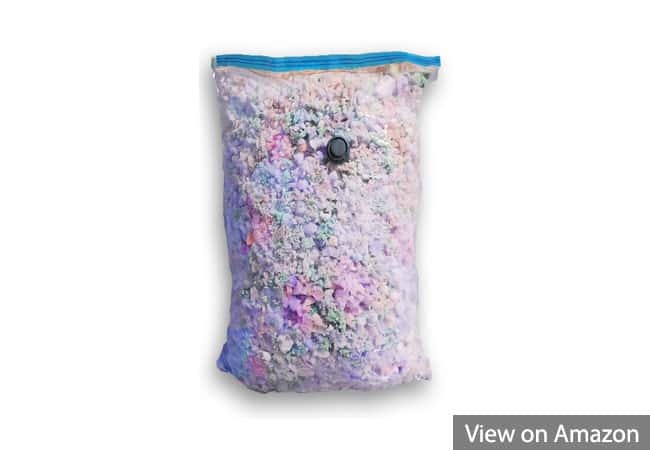 It would probably be a very heavy bean bag that you cannot move around your home that easily, yet, these pellets are pretty comfortable to sit on. Moreover, they don’t flatten that easily. If you need an alternative and more filler, check Plastic Pellets Bulk Box. Comes in 50 or 100 lbs box, are non-toxic, mold and mildew resistant, machine washable, and are made from virgin material (not bought as scrap, imported or re-processed from used plastic). It is recommended that you use 1 lb of plastic pellets for each 10 lbs of body weight for the user. Perfect for small-sized bean bags. Nontoxic, no odor, can be washed and dried. Comes in a heat sealed bag. Not suitable for large bean bags. 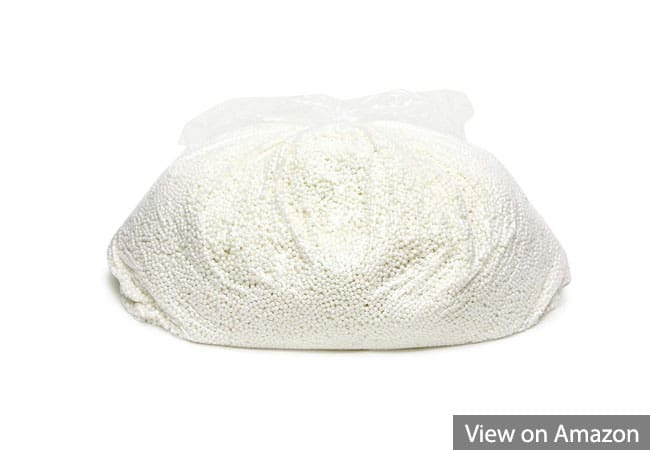 If you are you looking for supreme comfort, Fine High Density Shredded Memory Foam from Pro Foam Direct has a medium to fine consistency perfect for filling a bean bag chair. The best-shredded memory foams are ones that feel great. No wonder this product is the preferred choice amongst countless households all over the USA. Best of all, Pro Foam Direct do not use recycled or used foam to ensure the best quality. Plus, the memory foam does not give off a chemical smell like the beads did. Proudly made in California, USA. Perfect for use with bean bags, couches, love seats. Some complain about lots of hard parts inside. The small virgin polystyrene refill from Gold Medal are made in the USA and meets the California fire code Cal 117. These are the ultimate in fluffing up your bean bag chair. Not to mention, for the price that you pay, you’re really getting a good bargain. Virgin polystyrene beads are an ideal choice because they aren’t recycled and they will most likely last longer than beads or shreds that have been recycled. You can choose two refill bags, a 4 lb bag, or a small bag. Getting your first bean bag is always a great joy. Overtime, beanbags go flat so when you refill make sure it is properly filled to preserve its intended shape and comfort level. A 6 cubic foot bag of refill will fill a bean bag that is about 35 x 35 x 40 inches. This is just a guideline but hopefully will give you are starting point when purchasing bean bag refill. It is well known that beanbag chairs require low maintenance, yet, they do need a “basic set up” before they can be used. Don’t get scared, this step is very simple but needs to be done carefully to make sure that the chair is filled correctly. First, you need to determine the amount of filling you’re about to use. Too much filling and the beanbag will be rigid. Too little filling and it will be too soft and uncomfortable. That’s why a bag bag come with a label or documentation listing exactly how much filling is needed. Depending on model and manufacturer, this documentation may display a weight, or a volume. Once you determine the exact quantity, buy your fillings – consider to invest in an additional amount that can be used as a backup in the event that a certain quantity is spilled or disposed. Once you have the fillings, it’s time to call for help from a friend. Ask him to hold the bag so that the opening is easy to access and start pouring the filling until it reaches the right capacity. Don’t rush and distribute the filler material around so that it does not stick near the opening. If you want to save time, use a funnel to drive the filling inside the bag. If a funnel is not available, one can quickly be made by rolling up a sheet of paper and inserting it into the opening. As you pour the filler into the beanbag, continue to shake the fill so that it spreads around until the capacity is reached. Once you finish the filling operation, test the beanbag slowly because a sudden move may cause the beans to spill out across the room if the bag it wasn’t sealed properly. Once you are sitting on the bag chair, start to move around to determine if it has been filled enough. If you sinks into the beanbags too much, consider adding a small amount of filling. If the seat is too firm, try to remove some of the beans until you reach the perfect level of comfort. As you guess, achieving the desired filling level involves a bit of trial and error as everyone has a different comfort level. Now it’s time to start relaxing in style! If you’re curious, check our bean bag chairs alert for deals and price tracker. Reuse the filler for other bean bags – as we previously explain, bean bags require additional refill after a few year of use. Instead of buying new filler, you can save your existing filler for later needs. If you buy a new bean bag cover, which is less expensive than a new full bean bag, you can fill it yourself with the saved filler beads. Use the filler for other projects – if you love DIY projects, you can use the beans from bean bags in several ways. The filler is very soft, so they can be used as a cheap alternative for stuffing things like pillows, plush toys – as long as you ensure that they are double stitched and cannot be opened unintentionally by kids. EPS has highly insulating properties and, in combination with concrete, it can create a stone-like surface for creative projects. Garden statues, curved projects, or unusual items such as concrete countertops can be created using EPS concrete. You can use packing peanuts as an alternative to ice in a cooler to keep the contents cold, or in conjunction with ice to make the ice colder and last longer without melting. 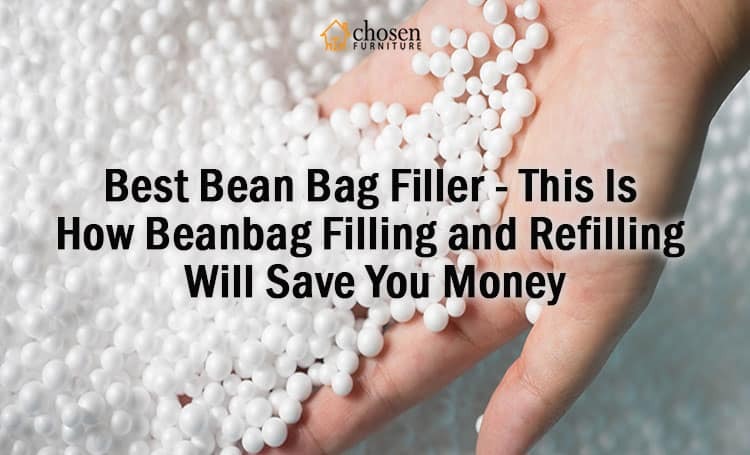 Use beanbag filler in garden– because these filling beads are light and airy, pour some of them into the bottom of a large plant pot, instead of using only soil. This lightens up the pot, and the beans will do no harm the plan. When using big containers, you need a large amount of soil to fill them – that gets expensive quickly, Most vegetables only need between 6 and 8 inches of soil, so any soil deeper than that is a wasted expense. Adding a few inches of foam or EPS beads to the bottom of the container reduces the amount of soil needed to fill the planter. One last thing here: we do NOT recommend using bean bag filler in open gardens! Use them as packaging material – these filler beans are used as packaging material for decades. Manufacturers rely on them for packaging because of their ability to prevent or minimize product damage during transit and have excellent insulation properties required, as an example, for food and medical shipments. And you don’t need as much filling as you think to protect the most fragile packages. Even better, since you do not need to buy bubble wrap, you can save money. Find someone else who can use the filler – if you do not have a use for the filler, storage it is not difficult, and try to find someone who may need it. To dispose filler beans, contact local shipping stores to see if they accept them for reuse. You could also contact schools, churches, etcetera to see if they reuse it in art or other DIY projects. Find a local recycling centre – EPS is not biodegradable, but it is is 100 percent recyclable. So, after replacing the beads, beans can be packaged and sold or delivered to a regional recycling center. If you’re not getting the support you used to be once, it’s time to re-energize your beanbag with a refill or perform a bean bag stuffing. We hope the answers below will help to answer your questions. What can you use to fill a bean bag? Most bean bags are filled with expanded polystyrene (EPS). Besides EPS, beanbags are filled with memory foam, shredded foam, polystyrene pellets, or other natural fillers. The beads used to fill most bean bags are made of expanded polystyrene foam (EPS), which is a hard-celled plastic very similar to Styrofoam, which is extruded polystyrene. Polystyrene can be produced in two forms, rigid and foamed, and it is commonly used as protective packaging and packing material. How many bags of beans does it take to fill a bean bag? This is a very common question when it comes to bean bags. Because every bean bag chair is a little different, here is a guideline: A 6 cubic foot bag of refill will fill a bean bag that is about 35″ x 35″ x 40″. This is just a guideline but hopefully will give you are starting point when purchasing bean bag refill. A 9 cubic foot beanbag filler should fill at least 1 adult size beanbag and probably two medium size bags, depending on how much filler you currently have in your beanbag. Can we fill cotton in bean bag? Yes, you can fill your bean bags with cotton or with other real natural beans that you can find in any grocery market. Keep in mind that natural beans will attract unwanted insects, bugs, or moisture. How long does a bean bag last? A good quality bean bag is supposed to last for around 3-5 years without changing the beans, depending on how you use it and maintain. Can you fill a bean bag with packing peanuts? Packing peanuts are now made from a variety of materials, but the most common material is polyethylene, which is a petroleum-based product similar to polystyrene. Packing peanuts are larger than polystyrene beads, so they’ll have a different feel in a beanbag. Packing peanuts are lightweight and usually recycled, just be sure you don’t get the kind that dissolves in water. Foam beads can be dangerous for young children if pieces can be bitten or pulled off. They are not suitable for children under 3 years because of the risk of choking. Are bean bags good for kids? Yes, they are great and fun. A bean bag for kids is safe, and a monogrammed bean bag can make them feel special. Kids bean bag chairs are sized just for them, in many fabric colors to please everyone. Can you wash bean bag with the beans in it? No, you can’t – you’ll end up destroying your beanbag. For bean bag chairs with removable covers, unzip the cover and pull out the liner containing the filler. Machine wash the bean bag cover in cool or warm water and detergent and then air or machine dry on medium heat. How do you clean an outside bean bag? Use a clean, damp cloth and warm, soapy water to remove outdoor dirt and grime, food spills and other mishaps. Periodic all-over cleaning will help keep your bean bags looking fresh and prevent dirt buildup. Use only diluted mild soap or detergent, and avoid products containing bleach. Finding a bean bag filler that meets your requirements can be a daunting task. Our buyers’ guide should help you overcome this challenge and pick an affordable product that will be perfect for your beanbag chair. Go through all the bean bag filling we review their features, their pros, and cons. After carefully studying all of these, see what matches your specifications and based on that pick the product which suits you most. Thus makes an informed decision which promises you money’s worth. With new shapes, contouring materials, and vibrant colors and patterns, today’s bean bag chairs for kids offer more comfort compared to other chairs. They can be used for movie nights, reading and pretty much everything your kids can think of. Lastly, beanbag chairs for kids do not need a lot of maintenance.